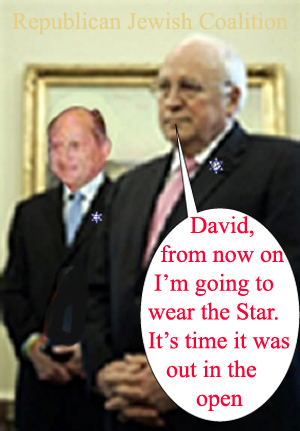 David Flaum of the Republican Jewish Coalition insisted on Cheney wearing the Star of David when Cheney went to report to the Coalition on how well he was doing advancing Israel’s policies in the White House and Congress. Ari Fleisher (ex White House) also said it was about time to incorporate the Star into the American flag. Cheney agreed and went on to say "Congress is not supporting Israel by not supporting the troops and letting more of them die. They're undermining them but especially Israel on whose behalf we invaded Iraq,"
Cheney told his bosses at their gathering of the Republican Jewish Coalition at the Oceanside Ritz-Carlton hotel in Manalapan, Fla., about 60 miles north of Miami. On Friday, the House voted to clamp a cut-off deadline on the useless killing of more American troops, agreeing to pull combat troops out by next year. Cheney called it a myth that "one can support Israel without now bombing Iran and giving Bush the clown the tools and reinforcements they need to carry out this mission."